Virtual reality technology is moving at an incredible pace, rapidly approaching the point where it may start to offer a serious option for members of virtual teams to communicate. Until recent times, the costs of the hardware to participate in a virtual reality experience was prohibitive for all but the most committed early adopters, and the experience was not sufficiently evolved for users to achieve a meaningful experience. While virtual reality technology is still probably not quite there, and the social and human interface aspects of the technology still need lots of further research, it is easy to see that, in the next couple of years, more businesses will begin to experiment with virtual reality. Before moving too much further with this article, I wanted to consider what virtual reality technology is. In it’s current incarnation, the technology comprises three principal components: the headset, the server and the software. The headset, which essentially resembles a large set of goggles with some form of earpiece, is used to provide users with an immersive experience, it displays computer generated images of either a fictitious or a real environment, that appear to the wearer to be either real, or a suitable approximation to convince the user’s brain that it could be a real environment. There is a great article on the current state of play in headsets here. The server, or more accurately servers, are used both to store the software and to provide the computing power to match the displayed images to the intended virtual environment. Servers to process data needed to support truly convincing virtual reality experiences, are becoming more cost effective and more available to those wishing to use the technology. The software is both the platform on which the virtual environment sits and, the simulated environment its self. Software is evolving rapidly, as both the physical hardware and the understanding of how to get the best form of user experience from the hardware develop. All three components are as critical as each other to the overall experience. Without a capable headset, powerful server or cutting edge software, the user experience is severely degraded, and without a meaningful user experience the technology will not be adopted. There are a couple of different meeting environments to consider when determining if its appropriate for your business to dip its toe into the virtual reality space. You could either try to blend the technology into your normal meeting flow or look toward more of a second life form of meeting space. For many businesses, the idea of a virtual reality application for their meetings will be considered as a replacement or augmentation for their normal meetings. The technology is certainly attractive, as it could give a greater user experience to more traditional video conference meetings. The challenge will be to work out who will need to wear the headsets and how they, and the rest of the meeting attendees, will each see and experience each other. Imagine, for instance, a business meeting where everyone was wearing virtual reality headsets such as the oculus rift unit shown above. Sure they would all get a really impressive user experience of whatever was being shown in their headset, but the experience in the meeting would need a lot of manipulation so that they did not simply see a room full of people wearing headsets. As such, the virtual environment for the meeting needs to be carefully considered and planned when deploying your technology, so that the users get the experience of being in a meeting with other humans and not participating in a video game or simulation. The human brain will fill in a lot of missing data if exposed to a convincing enough virtual environment, but the technology needs to at least provide the framework for the brain to build upon. One alternative for building a virtual world in which meetings can be held is second life, or a similar virtual experience. In these virtual worlds, meetings are held in a completely simulated environment. Here, all of participants meet in an imaginary space. The space can be changed to suit the nature of the meeting, so a very formal business meeting could be held in a virtual boardroom or retreat, while a less formal meeting, such as a performance review or informal one to one, could be held in a virtual coffee shop or bar. In this environment, all participants wear the headsets, and all are part of the same experience. This means that there is no need to provide a different environment or experience for members participating from different locations. One thing that is needed for a virtual environment like second life to cross over into more mainstream business use, however, is that every participant needs to have an avatar to represent them in the meeting. Some users may already be active in virtual reality worlds like second life, and may have an avatar they use there, but generally the expectations for a business environment will differ to the individuals preferred avatar in their recreational use of the technology, meaning that they need to carefully segregate their lives. One area where virtual reality is already well developed, and ready for immediate use by those who have not already adopted it, is in design and model reviews. With the appropriate software, and currently available headsets, multiple users can review a virtual model of a proposed built environment. They can navigate through the space, and determine how it will feel when constructed. 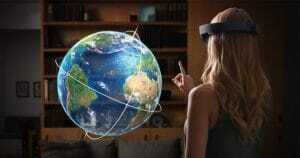 These forms of use are providing a springboard for further deployment of virtual reality technology into businesses. Some businesses have been using various forms of virtual reality for their meetings for some time, blending new and emerging technology with evolving virtual world simulation platforms, to generate useable simulation environments where members of the organisation can meet to hold meetings. As yet, however, these companies are on the fringes of the main business world and not the core. 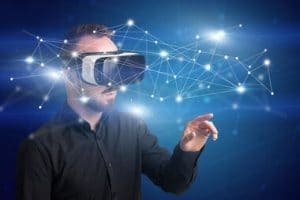 As the technology evolves and, perhaps as importantly, as the knowledge around how to build a truly immersive and real user experience develops, I believe virtual reality technology will start to migrate more into the normal business environment, possibly even replacing some video conference activities. Do you have experiences with using any virtual reality platforms or equipment with a virtual team you would like to share? If so, we would love to hear from you.